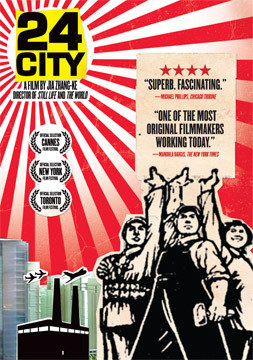 24 City is a documentary about the transformation of Factory 420 in Chengdu from the secret manufacture of military aircraft engines in 1958 to, after the Vietnam War, a downsized and remodeled facility producing consumer products, and then, more recently, into a privately owned real-estate development called “24 City”. This sounds pretty straightforward, but because it’s a Jia Zhangke film, it qualifies as an adequate description only in the most skeletal fashion. Factory 420 employed almost 30,000 workers, so a lot of life experience and displacement is involved in this multifaceted story—a good half-century of Chinese history. And Jia is so desperate to discover the truth of his subject that he’s willing to employ anything and everything, including artifice, if this will bring him any closer to what urban renewal is in the process of quickly obliterating. The theme of his film—of all his features to date, in fact—is the displacement coming from historical upheavals in China and the various kinds of havoc they produce: physical, emotional, intellectual, political, conceptual, cultural, economic, familial, societal. And sometimes the style involves a certain amount of displacement as well, such as when he cuts from a speech in late 2007 about recent changes in 24 City before a full audience in an auditorium to a shot of an almost empty stairway that plays over the same speech, with one figure climbing the steps on two successive floors. Jia addresses his ambitious theme by mixing documentary and fiction, a procedure he’s been developing in various ways throughout his career. It’s apparent here in the uses of music as well as in the mix of actors and nonactors, in both the mise en scène and the editing. But of course, blatant employments of theater and fiction, of pre-arrangement and construction, have informed documentary filmmaking since its earliest phases. It’s never enough simply to assert that “capturing reality” is the aim; there are always other agendas, and teasing out those agendas is partly a matter of discerning various stylistic decisions. When the Lumière brothers filmed workers leaving their own factory in 1895, using a stationary camera setup explicitly recalled in 24 City, the mode employed isn’t simply “actuality” but also a form of surveillance. And by the time Robert Flaherty makes Nanook of the North (1922), the mixture of modes has become still more complicated. In the film’s first extended sequence, Nanook the Eskimo in his boat paddles to the shore and disembarks, performing the equivalent of a circus act in which many clowns emerge from a tiny car as he helps to bring out each member of his family from the boat’s concealed interior: several children, his wife, the family dog. Documentary, in short, is a form of show business from the very outset, something constructed as well as found. So when Kevin B. Lee, in his review in Cineaste (Fall 2009, Vol. XXXIV, No. 4) rightly calls 24 City “an oral history project transformed into performance art,” we should acknowledge that Jia is being both innovative and experimental in one sense and highly traditional and commercial in another. Even if he’s being more obvious about the arranged and/or fictional elements here than the Lumières or Flaherty were—by utilizing four professional actors and four actual factory workers for the eight interviews featured in this film, as well as a cowriter, Zhai Yongming, who comes from Chengdu—he is none the less adhering to certain conventions that are as old as the documentary form itself. It’s important to realize, moreover, that Lu Liping, Chen Jianbin, Joan Chen, and Zhao Tao are all recognizable as movie actors to Chinese viewers. So the unconventional ways these actors are used has to be weighed against the various commercial benefits derived from their presence. In fact, although Jia started making features with state approval only after Xiao Wu (1997), Platform (2000), and Unknown Pleasures (2002), 24 City (2008) has been his biggest commercial success in China to date, surpassing both The World (2004) and Still Life (2006). Let’s consider each of the roles played by these actors, as well as the overall historical development implied by the order in which they appear—a pattern that was carefully traced by James Naremore in Film Quarterly (Summer 2009, Vol. 62, No. 4) when he placed this film at the head of his annual ten-best list. Lu Luping, first seen carrying an IV drip bottle, plays Hao Dali, the oldest, who joined the factory the same year it opened, when she was 21. Her heartbreaking story about losing her three-year-old son on a rest-stop during her journey by boat from Shanghai to Chengdu—whether this is a “real” story derived from an actual interview, a fiction, or something in between—followed by her watching an old propaganda film on TV, painfully dramatizes the degree to which nationalist and military obligations could supersede family in 1958. This is in striking contrast to the final interview with Su Na (Jia regular Zhao Tao), born in 1982 in Chengdu, who voices a very different kind of nationalist sentiment when she defends her capitalist career as a “personal shopper” who has purchased a new car to enhance her “credibility”, and who tearfully says she wants to buy her factory-worker parents an apartment in the new 24 City development. (It’s important to recognize that while westerners tend to view communism as “collectivist” and capitalism as “individualist,” the Chinese state has tended to view each practice over half a century of social transformation as a particular form of civic duty.) And in between these polar extremes are the monologues delivered by Song Weldong (Chen Jianbin), born in 1966 in Chengdu—an assistant to the factory’s general manager, seated at a counter, who recalls street-gang fights and having been spared from one beating by the recent death of Zhou Enlai—and by the somewhat younger Xiao Hua (Joan Chen), a factory worker named after the eponymous heroine of one of Chen’s earliest films, who plays on audience recognition by discussing her close resemblance to Joan Chen. If the latter registers as a joke, it’s a joke with some serious intent, because Jia evidently wants the Chinese viewers’ emotions aroused by these monologues to echo those solicited by the same actors in fiction films, and he also wants the viewers to be aware of these echoes. And clearly the juxtapositions of nationalist consciousness with both street fights and business, as emphasized in these latter two monologues, are part of the ambiguities and ambivalences that Jia is intent on exploring, with pop culture and state policy both playing relevant roles. It’s important to add that the performative role played by nonactors is no less important to the film’s feeling and design than the performances by the actors, and not simply or necessarily because they’re always closer to “the truth”. (Some of the formal poses of the portraits of workers are made to seem more artificial than some of the staged and written monologues, and the periodic fades to black, disrupting the flow of the interviews, discourages us from taking them as seamless documentary or fictional wholes.) Hou Lijun, born in 1953 and interviewed on a bus, may have more to say about displacements, family separations, and job loss than anyone else in the film, and her final statement, which Jia repeats as an intertitle—“If you have something to do, you age more slowly”—is clearly one the key lines. It’s no less important to bear in mind that part of the financing of 24 City came from the “24 City” development itself, much as the theme park which The World both explores and deconstructs also helped to finance that film. So there are multiple agendas at work here, some of them seemingly in conflict with one another, and the desire to experiment is tied to a kind of ideological juggling act that has made some Chinese viewers weep during portions of this film (reportedly, especially during the final sequence), but has also worried some critics, Chinese and western alike, about some of the implicit compromises and cross-purposes involved in such an enterprise. But Jia has been an ambitious risk-taker throughout his career, and the topics as well as the emotions that he chooses to take on here are, perhaps by necessity, as ambiguous and as openended as China itself.